The ability to grow cells in culture is an important and recognised part of biomedical research, but getting the culturing conditions correct for any particular type of cell is not always easy. These books aim to overcome this problem. The conditions necessary to culture different types of cell are clearly and simply explained in different volumes. 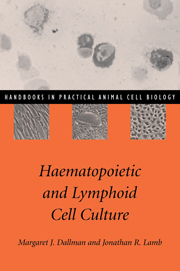 Each volume covers a particular type of cell, and contains chapters by recognised experts explaining how to culture different lineages of the cell type. These practical handbooks are clearly essential reading for anyone who uses cell culture in the course of their research.